in august 2013, following the release of group KILLSTREAK’s debut album Janus, tony the scribe moved to japan for five months. the details are hazy now, obscured by neon signs and bullet train breakdowns; what is left is the work. isolated in a bedroom outside nagoya for hours every day, tony spent his exile sinking into murakami novels and honing his writing to a bitter edge. out of that bedroom came something altogether different than what went into it—something both softer and harsher. a little more than two years later, we find tony the scribe snowed in at a house in northeast minneapolis, frantically working to reconstruct the last few years in sixteen bar segments. this is what implosion sounds like—half-sung harmonies wind around snares like broken glass, keys dissolve into a cacophony of reverb and delays. the roadmaps and designs for what he is building are lost; what is left is the work. what is left is fourteen minutes and fifty-four seconds of dark, cerebral, boom bap. what is left is mixed blood. hey. it's tony the scribe. i'll be releasing my first rap project since KILLSTREAK's "Janus" on june sixth, 2016. it's an ep called mixed blood. it's dark and vulnerable and i'm very proud of it. i'm looking forward to sharing it with you. 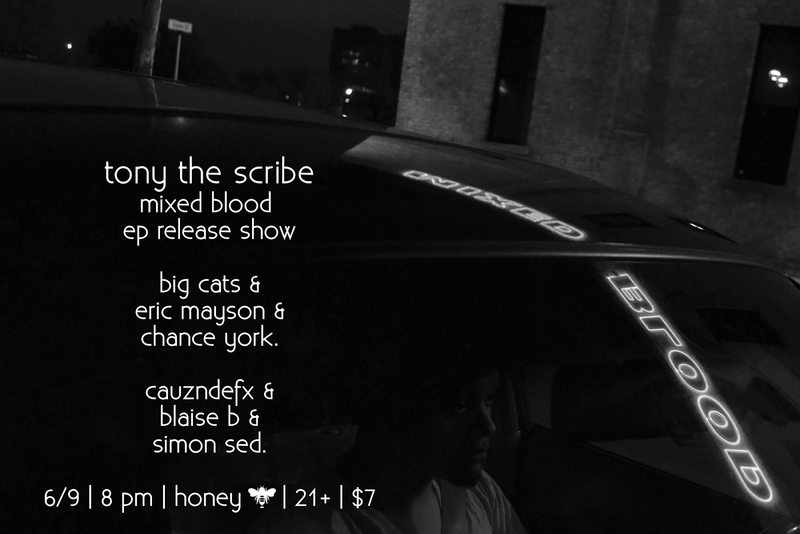 i'm going to be playing a release show for it on june ninth at honey (205 e hennepin ave, minneapolis). it's at eight pm, it's 21 plus, and costs seven dollars. big cats, eric mayson, and chance york are playing a joint set. cauzndefx, blaise b, and simon sed are playing too. 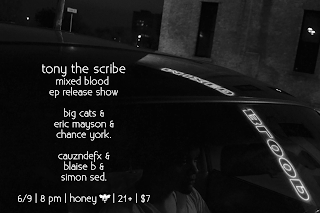 you can rsvp to that show here: bit.ly/mixedbloodrelease. So, since we've released Janus (Spotify link at the bottom if you somehow haven't heard it) , we've gotten a lot of really tight critical attention. Here are some excerpts and links to some of the press we've gotten recently! "5xt sits down with KILLSTREAK"
"Indie Spotlight: Six Questions With KILLSTREAK's Tony the Scribe"
"Stream: KILLSTREAK 'Janus' (Release Show tonight)"
"Local Gig List: July 8-14"